WASHINGTON — Ten days after NASA Administrator Jim Bridenstine effectively canceled a visit to the United States by the head of Roscosmos, Dmitry Rogozin, the two spoke by phone Jan. 14 to smooth over differences between the two. The shutdown didn’t prevent NASA from announcing Jan. 4 that Bridenstine had indefinitely postponed a visit the United States by Rogozin that had been planned for February. That came after growing congressional criticism of the planned visit since Rogozin is one of a number of sanctioned Russian officials because of his role, in his previous post as deputy prime minister, in the 2014 annexation of Crimea from Ukraine. Roscosmos officials subsequently complained to Russian media that they had not been formally notified of the cancelled trip by NASA, learning about it through American media reports instead. A Roscosmos spokesman told the Russian news service TASS Jan. 11 that it finally received an official letter from Bridenstine about the withdrawn invitation. Rogozin, in an interview with the Russian television network Rossiya-24, claimed that the trip was cancelled because a “second American civil war” was in progress. Such rhetoric is not out of place for Rogozin who, during the height of the Crimea crisis in 2014, threatened to ban exports of RD-180 engines and deny access to Soyuz seats for flights to the International Space Station, saying that NASA would need a trampoline in order to go to space. The Roscosmos statement, though, showed no sign of animus towards NASA because of the cancelled visit. In the statement, Roscosmos said that Bridenstine and Rogozin emphasized cooperation between the two agencies on both the ISS and potential future lunar projects. 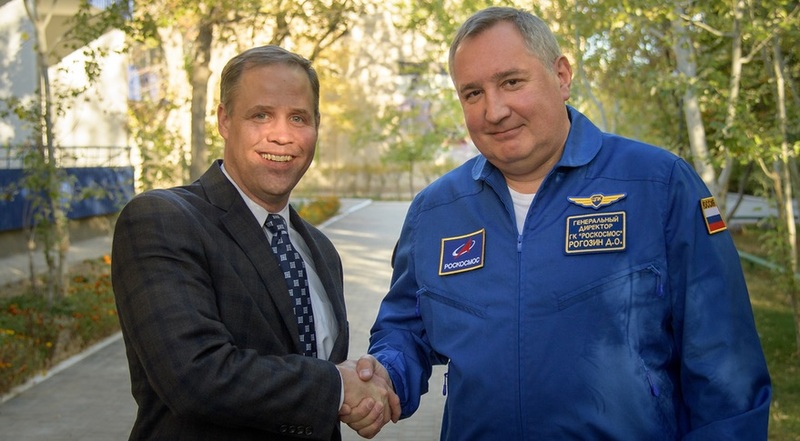 Roscosmos also stated that Rogozin invited Bridenstine to come to Russia, or the Baikonur Cosmodrome in Kazakhstan, for a face-to-face meeting in the coming months. Bridenstine, the statement added, confirmed his interest in such a visit. Baikonur was the setting for the first and, to date, only in-person between between Bridenstine and Rogozin, in October prior to the aborted launch of the Soyuz MS-10 spacecraft.